A lightsaber is a weapon used by several minifigures in the Star Wars theme. The weapon was first introduced in 1999, and except for 2001, it has been used in at least one Star Wars set every year. A group of Jedi Padawans with blue-bladed lightsabers. The most commonly used lightsaber is made up of two pieces- a hilt and a single blade. This hilt is most commonly Part:64567, which allows for a blade to be inserted at either end, or in some cases Part:23306 is used, a similar piece with slight changes to the ridges on the piece. Lightsaber hilts were first released in shiny Metalised Silver, but then later came more commonly in a flat Medium Stone Grey colour, before most of them again changing to dull silver. Hilts have also come in three other colours- both of the Sith warrior's lightsabers come with black hilts, Chancellor Palpatine came with a gold hilt in 9526 Palpatine's Arrest, and both variants of Jek-14 come with a white hilt. Like the hilt, the blade piece, Part:30374, was first used for the lightsaber. The blade is a rod which can fit into either end of the lightsaber hilt, and is four studs in length. While the colour of the blade varies, it is always a transparent colour. 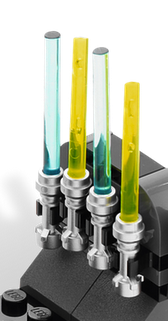 In the first year of the Star Wars theme, three different types of lightsaber blades were used- transparent light blue, transparent fluorescent green and transparent red. Later in 2005, a transparent violet blade was made for Mace Windu. 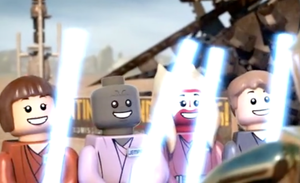 To this day, Windu is the only minifigure to come with a violet blade. In 2011, the green-bladed lightsabers were changed over from transparent flourescent green to transparent bright green, which is darker and appears less yellow. Darth Maul and Darth Vader with their red-bladed lightsabers. A double-bladed lightsaber, also known as a saberstaff, is a variant on the traditional lightsaber. This weapon is made up of three pieces- a hilt, with blades coming out of either end of the hilt. The first double-bladed lightsaber was introduced with Darth Maul in 1999 with the set 7151 Sith Infiltrator, which had Maul with a metalised silver hilt with two transparent red blades. Since then, other variants of Darth Maul have had him with hilts of other silvery shades. In the 2012 set 9497 Republic Striker Starfighter, Satele Shan comes armed with a double-bladed lightsaber with a silver hilt and two transparent light blue blades, and the Jedi Consular comes with a double-bladed lightsaber with transparent bright green blades in 75025 Jedi Defender-class Cruiser. In 2002, a new hilt was designed for Count Dooku. This metalised silver hilt is based upon Dooku's hilt from the Star Wars universe, which features a curve to it. This variant of hilt is exclusive to Count Dooku, and he has been armed with it in every set he has appeared in to date. Dooku's lightsaber always has a single transparent red blade. 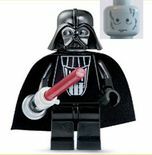 A light-up lightsaber minifigure is one which is unable to be disassembled except for any pieces attached to the top of the head, and has a grey lightsaber hilt built into the minifigure's right hand. This hilt cannot be rotated, but has a hole in the top for a blade to be inserted. 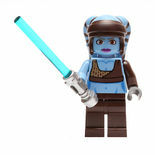 When the head is pressed down, the blade illuminates due to the light coming out of the hilt, as a battery is present inside these minifigures. Five of these minifigures were made- one each of Mace Windu, Luminara Unduli, Darth Vader, and Episode III versions of Obi-Wan Kenobi and Anakin Skywalker. A paired lightsaber in the Star Wars universe is a set of two single-bladed ligthsabers which can be joined together to form a double-bladed lightsaber or linked by a fibercord so that they can be flailed. 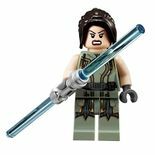 These functions of the paired lightsabers do not appear in LEGO form, but different hilts are used for these sabers. These hilts are made so that a blade can only be attached at one end, while the other end tapers off, and features a slight curve. The paired lightsaber is exclusive to Asajj Ventress, who always wields two of these with transparent red blades in every set she appears. The darksaber is a variant of lightsaber based upon an ancient lightsaber which had a flat black blade. This lightsaber features a standard silver metallic hilt, but unlike other lightsabers, does not feature a transparent blade. Instead, the blade is solid black in colour. The darksaber has appeared in two sets- 9525 Pre Vizsla's Mandalorian Fighter where Pre Vizsla is in possession of the blade, and in 75022 Mandalorian Speeder, where Darth Maul wields the blade alongside a single red-bladed lightsaber. A Shadow Guard with a lightsaber pike. 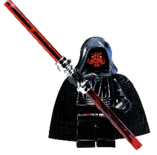 The lightsaber pike was introduced in 2015 as a weapon to be used by the Shadow Guard minifigures. This form of lightsaber is composed of three pieces. The handle is a grey piece which has been used in the past as a telescope or for blaster cannons on ships. The red blade extends from the larger end of the piece, while the grey shaft is attached to the narrower side. This form of lightsaber is based on The Inquisitor's personal weapon, who came armed with it in 2015. The hilt is a brand new piece coloured dark silver, which is circular with a handle running through the centre of the circle for a minifigure to grip. At the end of each side of the handle are areas for the two red blades to be attached. 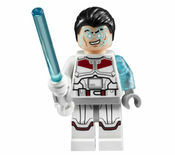 Ezra Bridger's lightsaber was released in 2015. It is made up differently to other standard lightsabers due to its design in Star Wars Rebels which features a blaster pistol built into the handle. Instead of a standard hilt piece, a grey piece commonly used for binoculars is used. The blue blade then extends from one of the two holes at the end of the piece. 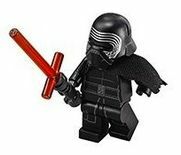 The crossguard blade was the fourth new lightsaber variant to be introduced in 2015, and to date is exclusive to Kylo Ren. The hilt for this lightsaber is a standard one, except it is coloured Titanium Metallic, a darker silver than most standard hilts. The blade is red, but instead of just a straight blade, the blade is cross-shaped. When inserted into the hilt, the horizontal part of the blade sits just above where the blade is inserted, gving the impression of a crossguard. Lightsabers have appeared as weapons in all four LEGO Star Wars games. In LEGO Star Wars: The Video Game, LEGO Star Wars II: The Original Trilogy and LEGO Star Wars: The Complete Saga, characters armed with lightsabers had the ability to attack objects and enemies with this weapon, and also deflect incoming lasers. 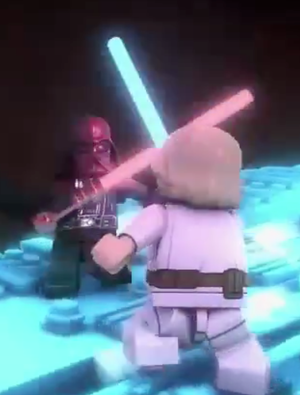 In LEGO Star Wars III: The Clone Wars, extra lightsaber abilities were added, including throwing a lightsaber at objects and enemies with the Force, cutting through or destroying certain walls, and destroying certain enemies with a finishing lightsaber move. Luke Skywalker and Darth Vader duelling with lightsabers. The lightsaber was a weapon commonly associated with members of the Jedi and Sith Orders. They had the ability to deflect fire from blasters and cut through most objects. Though it was difficult and dangerous for untrained users to wield a lightsaber, in the hands of an expert, the lightsaber was a formiddable weapon. The most common form of the weapon was composed of a hilt for the user to hold, and a coloured blade of energy which extends from the hilt when activated. Traditionally, green and blue blades were associated with the Jedi, while the Sith and their allies tended to use a red blade. Throughout history, there were several battles involving lightsaber combat, including a duel between Darth Maul, Qui-Gon Jinn and Obi-Wan Kenobi during the Battle of Naboo, and several Jedi during the Clone Wars encountered the Sith Lord Count Dooku and his allies, General Grievous, Asajj Ventress and Savage Opress. A pivotal battle was fought with lightsaber towards the end of the Clone Wars when Mace Windu, Kit Fisto, Saesee Tiin and Agen Kolar discovered that Chancellor Palpatine was the Sith Lord Darth Sidous, however, Palpatine survived when Jedi Knight Anakin Skywalker came to his aid and killed Windu, later becoming Darth Vader with Palpatine becoming the Emperor of the galaxy. During the Galactic Civil War, Obi-Wan Kenobi fought Vader on the Death Star, where Kenobi was killed but became one with the Force, and Vader's son, Luke Skywalker fought his father on Hoth and the Second Death Star. This page was last edited on 5 June 2017, at 15:32.